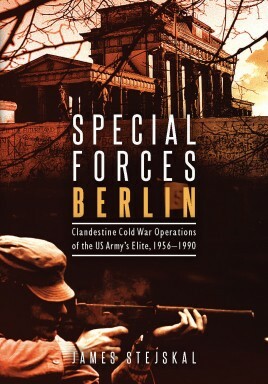 Special Forces Berlin relates the history of a little known and highly classified US Army Special Forces Detachment that was covertly stationed in Berlin, Germany from 1956 to 1990, poised to act if war ever broke out between the West and the Soviet Union and its allies. Their mission, should hostilities commence, was to wreak havoc behind enemy lines, and buy time for vastly outnumbered NATO forces to conduct a breakout from the city. In reality it was an ambitious and extremely dangerous mission, even suicidal. Highly trained and fluent in German, each man was allocated a specific area. They were skilled in clandestine operations, sabotage, intelligence tradecraft and able to act if necessary as independent operators, blending into the local population and working unseen in a city awash with spies looking for information on their every move. James Stejskal is a military historian and conflict archaeologist who specializes in the research and investigation of irregular warfare. He is author of numerous articles and two books, including the highly praised Special Forces Berlin: Clandestine Cold War Operations of the US Army's Elite, 1956–1990 (Casemate 2016). His 35 years of special forces, special operations, and intelligence experience with the US Army and the CIA around the world, give him unparalleled insight into unconventional warfare. Most recently, he was a member of the Great Arab Revolt Project, an archaeological expedition that tracked and validated the experiences of T. E. Lawrence in the Hejaz. "... a story that had to be told, and who better to tell it than Chief Warrant Officer James Stejskal who has established his credentials as a historian and researcher in various articles as well as his seminal work on the Swakop River Campaign and World War I in South West Africa The Horns of the Beast. In addition, his service in the US Army Special Forces in Berlin during the 1970s and 80s gives him the insight to comment cogently on that portion of US Army Special Forces history that impacted on the doctrine of both urban unconventional warfare and counter terror operations. ... a historical record without which the story of United States Army Special Forces would not be complete. Congratulations to Chief Stejskal on an excellent work of military history." "James Stejskal has performed a great service to not only Special Forces but to the national security community by researching and writing this highly readable and anecdote filled history of one of the most unsung military organizations in the Cold War... this is one of the best examples of applied unconventional warfare in special operations history." "Reads like a thriller for much of the time - a small, select force ready for action should the Soviets escalate their activities in Western Europe - nothing much has changed in the last sixty years or so!" "Far too often, unit histories are a combination of tall tales, in-jokes, and details without any context. [Stejskal has] succeeded in placing a very small and unknown unit in the larger context of the Cold War in Europe, producing an account that is historically accurate and judicious and yet enjoyable to read. This study is rewarding for anyone interested in the Cold War, Special Forces, or Berlin. In fact, this is a considerable achievement, a contribution to history that gives the reader a micro-view of the realities of military life." "Special Forces Berlin is a must-read for military historians and should be mandatory reading for future generations of professional military leaders. In addition to adding to the body of knowledge of the Cold War years, the author—himself a former Green Beret—has lifted the veil of secrecy surrounding an elite Special Forces organization. The incredible story of these unsung heroes needed to be told. Stejskal has helped bring Special Forces Berlin in from the cold."